Rich in history - Queen Margaret of Scotland, William Wallace and Robert the Bruce are just a few of the well known figures who have visited Kinross-shire. Kinross is the ideal position to base your stay in Perthshire. Small and quaint, Kirkland's Hotel is a traditional 18th century coaching inn offering accommodation in the town centre, while both the Windlestrae Hotel and the Green Hotel (only 30 minutes drive from Edinburgh!) offer superb 4 star hotel hospitality including, golf (2 golf courses right next door), business, leisure and romantic packages. Take M90 junction 2 to Dunfermline, continue toward town centre for 3 roundabouts. Turn right at traffic lights onto B916, (Aberdour Road), hotel 1/4 mile on right. FROM THE FORTH ROAD BRIDGE At Junction 1 continue forward onto the M90 (signposted Aberdeen, Dundee, Perth) M90 at Junction 2 branch left, then join the A823(M) motorway (signposted Dunfermline) At roundabout take the 2nd exit onto the A823 (signposted Dunfermline) At roundabout take the 2nd exit onto the A823 (signposted Town Centre, Crieff) Continue on ½ mile At roundabout take the 2nd exit onto the A823 (signposted Town Centre, Crieff) At Saint Leonards Roundabout take the 2nd exit onto the A823 (signposted Kincardine Bridge, Stirling Crieff) At roundabout take the 1st exit onto Nethertown Broad Street - B9156 (signposted Carnegie Birthplace Museum) At traffic signals turn right onto Moodie Street (signposted Carnegie Birthplace Museum) Turn left onto Priory Lane following road round onto Saint Margaret Street Turn left onto Abbot Street at end of road. This road leads onto Maygate. Follow road round into Kirkgate turning first left into Bridge Street The Hotel is on your Right FROM THE KINCARDINE BRIDGE Follow the A985 Dunfermline, Continue along this route until you come to a large roundabout, take the A994 to Dunfermline. In Dunfermline, turn right at the 2nd set of traffic lights into Chalmers Street, the road goes round to the left into a public car park.The Hotel is to the right. COMING FROM THE NORTH ON THE M90: Exit at junction 3- follow the A907 into Dunfermline Centre. Straight across the large roundabout, at the fourth set of traffic lights turn left into Chalmers St. The road goes round to the left into a public car park, the Hotel is on the right. Balnacraig sits in the rural village of Saline a few miles North West of Dunfermline with spectacular views of the Ochil hills and Wallace Monument. 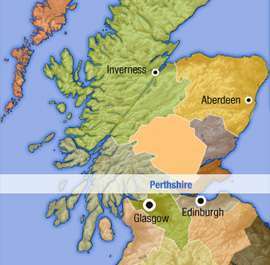 Good base to explore Fife, Edinburgh, Perth & Stirling. Please note that our Family room does accept children. Please call LateRooms to check availability and prices. Dunfermline – 15 minutes away. Rosyth Ferry – 20 minutes away. Stirling – 30 minutes away. Edinburgh Airport – 30 minutes away. Glasgow Airport – 60 minutes away. If you're comimg from Edinburgh, or the airport, head North to the Forth Road Bridge(M90). After the bridge exit at junction 3(Dunfermline). Follow the A907 towards the town centre.At the main roundabout take the 3rd exit(Crieff). After 700yrds take 4th left turning onto Chalmer St, this leads to a dead end in a large carpark. The hotel is now infront of you. Markinch Train Station - Road: Drive to A911 in Leslie, Head east on Mitchell Terrace toward Coaltown Rd/B9130, Turn right onto Coaltown Rd/B9130, Turn left toward A911, Turn left onto A911, At the roundabout, take the 3rd exit onto Queensway/A911, At the roundabout, take the 2nd exit onto Leslie Rd/A911, At the roundabout, take the 2nd exit and stay on Leslie Rd/A911, At the roundabout, take the 2nd exit and stay on Leslie Rd/A911, At the roundabout, take the 2nd exit onto A911, The Greenside Hotel is on the Right. Travelling from the North on the A90, cross the Tay Bridge stay on the A92 take the turn off and follow the signs for Kirkcaldy West. At the roundabout take the 3rd exit follow to the next roundabout and take the 5th exit signposted Dean Park Hotel, the hotel is located 300 yds from this point. From Edinburgh Airport /Edinburgh follow the signs for the Forth Road Bridge, on crossing the bridge take the M90 North and turn off at the A92A92 signposted Glenrothes/Kirkcaldy, take this road until you see the signs for Kirkcaldy West. At the roundabout take the 3rd exit follow to the next roundabout and take the 5th exit signposted Dean Park Hotel, the hotel is located 300 yds from this point. Kirkcaldy Train Station Exit the hotel follow the signs to Town Centre and the station is located 4 miles along this road from the hotel. Kinross - Road: Take exit 6 from M90.At roundabout, turn left on to Springfield road,Turn left on main street,then 1st right on to A922(High school on left).Continue to junction,go right on to A911.Come to Kinnesswood.Turn left on to Bruce road(signposted to Portmoak school).First left on to BroughTerrace .Arisaig is first house on left. We offer a choice of three bedrooms and a self catering apartment; all have been newly refurbished to a high standard. Freshly decorated, bright and spacious with views overlooking Falkland square. All rooms are en-suite with TV and tea/coffee making facilities. Whether for business or pleasure, our rooms offer a home from home comfort. After your stay, wake up with a full Scottish breakfast before setting off for the day. The Hotel's restaurant is a coffee shop during the day and a Bistro/Restaurant in the evening with a carvery available on a Sunday. The Food is imaginative, well presented using fresh local produce with a mix of traditional and modern Scottish culinary skills. There is an all-day menu which offers an excellent choice of dishes including, Beefburger, Ciabbata, Sandwiches, Baked Potatoes and delicious home baking. Also delightful sweets and various coffees and teas available. There is also a quaint wine bar to relax and enjoy a various selection of wines, beers and spirits. The South/M90 - Road: Traveling from the south on M90 take junction 2a and follow A92 for Glenrothes. Continue past Glenrothes to New Inn roundabout and take 1st left to Falkland (2 miles). The North/M90 - Road: Traveling from the north on M90 take junction 9 onto A912 for Gateside. Turn left onto A91 to Strathmiglo then turn right and follow signs for Falkland. We are situated on the high street directly opposite the church and 100 yards past Falkland Palace.